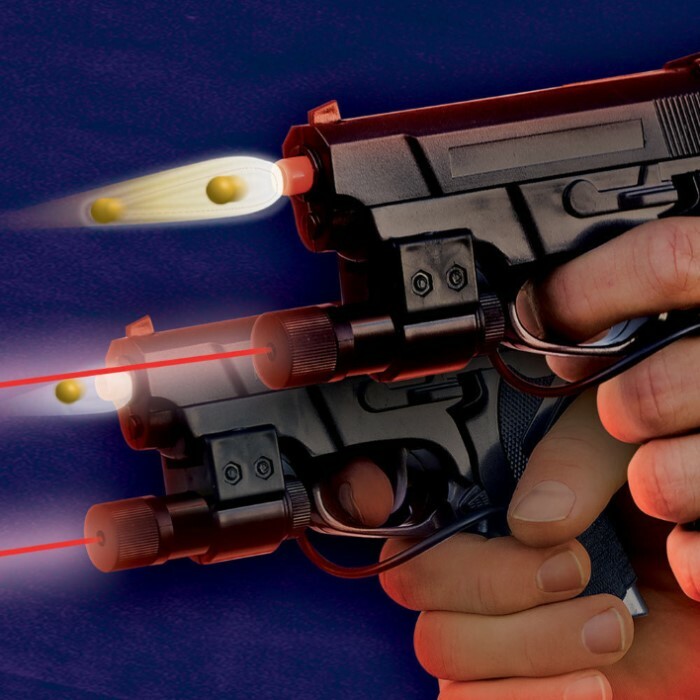 Spring Airsoft Pistol with Laser: Buy One Get One Free! | BUDK.com - Knives & Swords At The Lowest Prices! 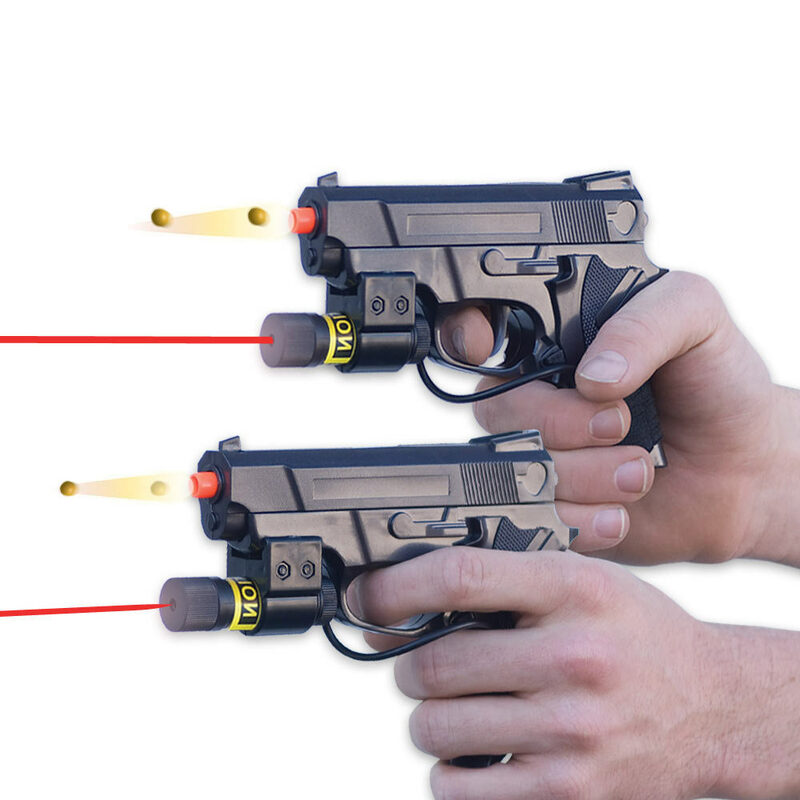 Spring Airsoft Pistol with Laser: Buy One Get One Free! This high-powered Airsoft spring action pistol features a laser sighting system that gives BBs pinpoint accuracy as they blast out of the barrel at 220 feet per second! Disclaimer: Federal law requires orange tips. Do not remove the orange tip found on your airsoft gun. I bought two of them. One for me and one for my little brother. We were really excited to play with them. Once my little brother opened his and put in the bb's. He cocked it back and it instantly broke in his hand cutting himself in the process. I would not reccomend these to anyone. A big waste of money on my part. The laser sights are off by a mile. Two of our lasers didn't even work when we removed the white paper. These are good little pistols to teach safe handling but both broke within a day. Well, at least one of the two worked upon arrival. The slide on the first gun fell apart as I took it out of the box. Maybe I can glue the broken mountings back together; maybe not. The second gun seems to work OK, although when I released the magazine the first time to load it, a chunk of plastic fell out from inside the gun. Don't know how long it will function, but at least for the moment I've got 1 out of 2 from my 2 for 1 purchase. On the plus side; both lasers light up. Great little starter guns to teach safe handling and shooting. A little stiff to handle and sight picture is off, but the value in teaching good firearms training is there. The only reason I gave it 1 star is because it wouldn't let me choose any less. As soon as we started using the air soft guns they literally started falling apart. Even for cheap guns, these are incredibly cheap, even as a gift they would still be over priced. Not a good buy. These guns are really cheap, you can feel it just by picking them up. However they are also cheap as in money. You also get two. They are ok, for the money. The laser is fun even without the gun though. At first I thought that the laser activator was crappy but I am liking the way you activate it more and more.